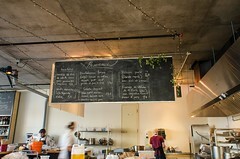 TheKitchn's in-depth profile of Michelle continues with a tour of the Foodlab. The thing is, TheKitchn doesn't typically cover restaurants. They're very much focused on home kitchens and home cooking. But they were interested in how the Foodlab works with homestyle cuisine, and they were especially interested in how Michelle's philosophy and her practice extends from home to the workplace, and from the workplace back into the home. The photographs are lovely, and they were taken last fall, so you can see Seth & Michelle and rest of the gang working busily on their Provence menu. All I could think of was warmth, and al fresco dining, and rosé, and it felt pretty good.